Our preso covered our top ten low cost/no cost/high return ideas for RA in public libraries – these factors being especially important in small libraries with low staff numbers, but still relevant to large library services in times of tight budgets. Among other things I gave a 15 second review on Megan Caldwell’s Vanity Fare and the attendees recommended a great follow-up for readers of 50 Shades of Grey – Rachael Treasure’s 50 Bales of Hay. Have you enough reading knowledge to recommend to others? We’ll include these ideas in our project report. 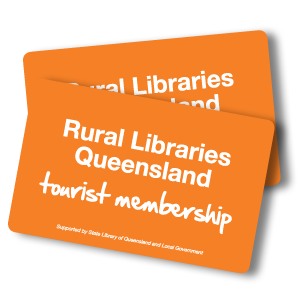 Something the rural libraries have now, that we’re all envious about, is their RLQ Tourist Card which enables people living or travelling in outback Queensland to borrow from all RLQ libraries. And they have a combined catalogue across 28 member Councils. Imagine all those possibilities for collaboration across RLQ with bookclubs, eAudiobooks, reviews, etc. 130 library services across South Australia also have this collaborative opportunity with One Card . Victorian libraries are also going for united strength. We would love to hear from staff in these libraries to let us know how you’re using the One Card concept to support the delivery of outstanding readers advisory service.